Last year, Intel poached a portion of AMD’s graphics department talent, and now Team Blue may well buy the whole red company this year. At least that’s the going rumor according to the EETimes, which claims to have picked up word that Intel may acquire AMD from a few C-Level executives at the company. However, this all seems unlikely to happen for a number of reasons, if you ask us. This is hardly the first time Intel has been rumored to buy out AMD, with the biggest difference this time around being that AMD is in a position of strength now. We can just look at the two companies’ performances at CES 2019 to see which is doing better. Intel spent its presentation on dissuading any doubt surrounding the existence of its 10nm processors by demonstrating five different iterations of its future-facing silicon in action. AMD, on the other hand, had a much more focused keynote with three product lines coming this year. The keynote included AMD’s next-generation 7nm Ryzen 3rd Generation processor, a return to high-end graphics cards with the Radeon VII and its renewed mission to capture the laptop market with 2nd Gen Ryzen mobile chips. Aside from AMD having much more to lose than gain from the acquisition, there are several regulatory and anti-trust hurdles to overcome if such a merger were to take place. 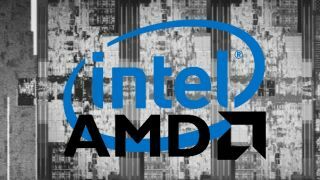 So, we’d say that Intel buying AMD is a fairly long shot at this point. Rather, this year seems likely to be one of the most interesting times for computing in a long time with the big three (Intel, AMD and Nvidia) really going at each other.